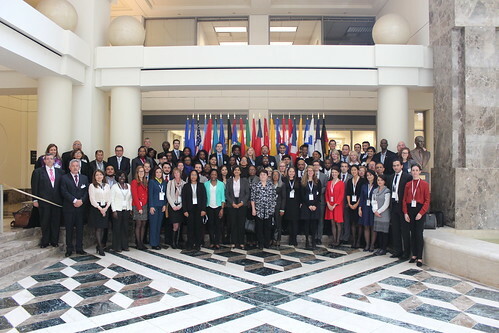 A Global Forum assessor and assessed training seminar took place in Washington D.C. on 14-18 November 2016 . It was organised in joint cooperation between the Inter-American Development Bank, the Internal Revenue Service (IRS), and the Inter American Center of Tax Administrations (CIAT). The training was a great success with 70 tax officials from 27 jurisdictions, in attendance. The training took the form of a 5-day seminar with a “360 degree” format designed to prepare both assessed jurisdictions and assessors for the second round of EOIR peer reviews which has commenced in the second half of 2016. Over the course of the five day seminar participants experienced a mock peer review process which focused on the most important aspects including follow-up on the Phase 2 report, participation in a mock onsite visit, drafting of a mock EOIR report and participation in a mock PRG meeting. On the final day all participants were awarded a certificate for attendance. This seminar is to be rolled out again on a regional basis in 2017 – in Chile in March 2017 and Romania in the fall of 2017.